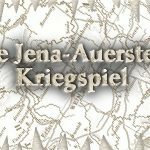 I have played in a fair number of Kriegsspiels, and run a bunch more, and each one teaches something about the nature of warfare in the era. The troop columns are very long. Even under the simplified system used, a French division of 8,000 men stretches over 4 km. A division of 2,000 cavalry stretches to the same distance. In the mixed divisions — common among the Prussians — a 9,000-man division consisting of 7,000 men and 2,000 cavalry covers 7.5 km with an additional 15% penalty because of the relatively poor organization of their wagon train over against the French. Only one division can have a given road at a time. My friend Doug Miller has written about this elsewhere, but there is a remarkable display at the Deutsches Historisches Museum on the history of road improvement in Germany from the time of the Thirty Years’ War to the Napoleonic era. (Author’s Note: All museums should have displays that awesome.) It makes many points, but the one relevant here is that these divisional columns would never have been able to move side-by-side without dramatically slowing their march rates. You do not want the MOVEMENT PENALTY. In my household, it is a rule when measuring Kriegsspiel marches by anybody silly enough to think he can save time by going off-road that one say MOVEMENT PENALTY in the most ominous voice possible. It certainly can be attempted in a pinch, but is a very poor way to get to the battlefield. All through our visit to this battle space, my wife and I repeatedly looked at the hills, the forests, the rivers, and everything else and said, yes, MOVEMENT PENALTY. The battle space in the game is relatively small. “Flight of the Eagle” decrees that battles generally occur in an area of five square kilometers and that until a column arrives inside that square it cannot be deployed for battle. Commanders were only working with 12-hour days. The hours of daylight in October in Thuringia are judged by the rules to be 0600 through 1800. Marching after dark incurs a dramatic penalty in fatigue and no force can move more than 20 hours without rest. Fights after nightfall — in the darkness of 1806 that is difficult for folks today to imagine — were very rare and I allowed them only under exceptional circumstances. Given all this, I think it is easy to see why an enemy who did not want to fight did not have to, all else being equal. That lead to days of marching and pushing by the French followed by nights, and even entire days, of needed rest. It was, I think, an entirely historical result and the best commanders learned this rhythm and sought to take advantage of it. Enough, though of me. How about, well, me, talking about the game? (Author’s Note: This could have gone very, very badly for the Prussians if the division detached by Napoleon (as shown in the earlier video) had been allowed to stay. On the other hand, this was proof if ever any was needed that the Prussians could give as well as they got. The St. Hilaire save was huge.